My roommates from Bonn arrive in the room after a night of revelry around 5:30am, and from this point onward I am irrevocably awake. Cautious to be quiet as I’m able, I escape from the dorm room to the common room to await the opening of the bar for breakfast, and I take some notes. The internet, oh-so-slow for the last two days and essentially unusable, is currently moving at a pace that is just quick enough to do what I must right now. Everyone else in this big- hostel being asleep probably helps. I note the names and addresses of seven different bookstores with English-language sections around town. I write down a few other details for each, as well: opening hours, nearest U-Bahn or S-Bahn stop, and walking directions from each stop. The first on the list is in Prenzlauer Berg, just 2 km north of my location, so I’ll hoof it up there and then take a train south to West Berlin for the next one on the list. 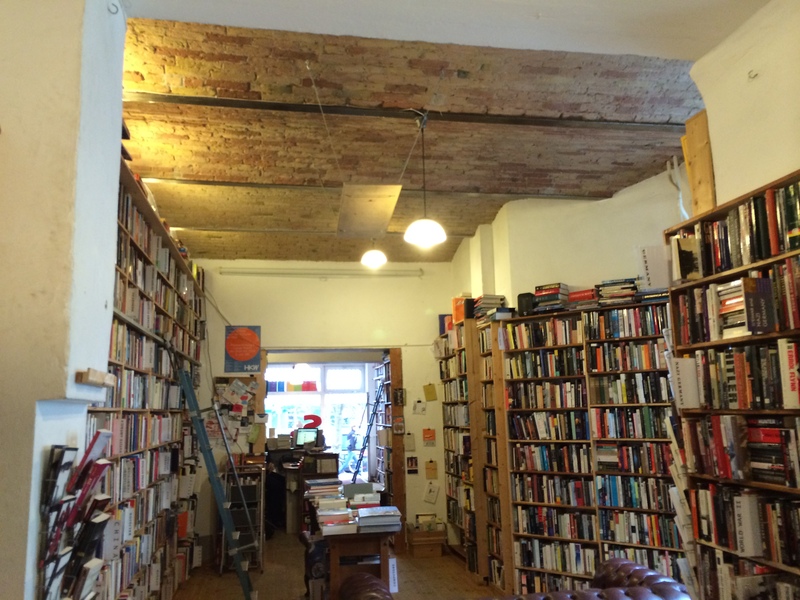 St. George’s English-language bookstore boasts holding some 30,000 titles, and a few people online have noted that they keep a decent collection of German-to-English translations that are tougher to find in other shops. It’s in this collection that I’m most interested. 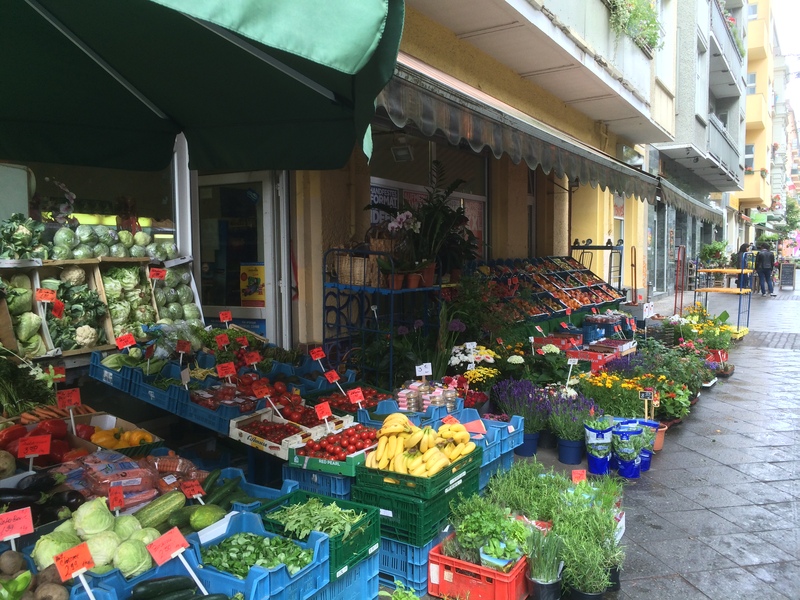 When I walk north, I admire the distinct character that Prenzlauer Burg offers: neighborhood shops are more numerous here, with dozens of cafés with sidewalk seating and many grocers placing fresh fruit and vegetables out on large displays under uniquely painted awnings. The apartment buildings are all five or six stories high, with eloquent designs decorating their facades and pastel colors on their concrete sides. When I find St. George’s bookshop, I fall in love with it immediately. The room is deep and somewhat narrow – about 35’x15’, and the stacks on both sides run floor-to-ceiling, some 7 feet above my head. Movable ladders provide access to the volumes on higher shelves. The shopkeeper has Lou Reed playing over the speakers. The floor is a well-kept hardwood, and overhead is an arched, red brick ceiling. There are several leather sitting chairs for the customer’s comfort. The Robert Musil book, The Man Without Qualities (auf Deutsch: Der Mann ohne Eigenshaften), is new to me. I’m fascinated by the concept: the main character fears he has none of the qualities ascribed to him by the people and the world around him. I can relate to this fellow. I ask the man behind the desk if he knows much about it, and he informs me that I might be able to find this tome, which in one volume runs over 2,000 pages, split into more than one volume. But not here. Ah ha! A mission. This is the book I’ll be looking for as I scour the bookstores of Berlin over the next few days. 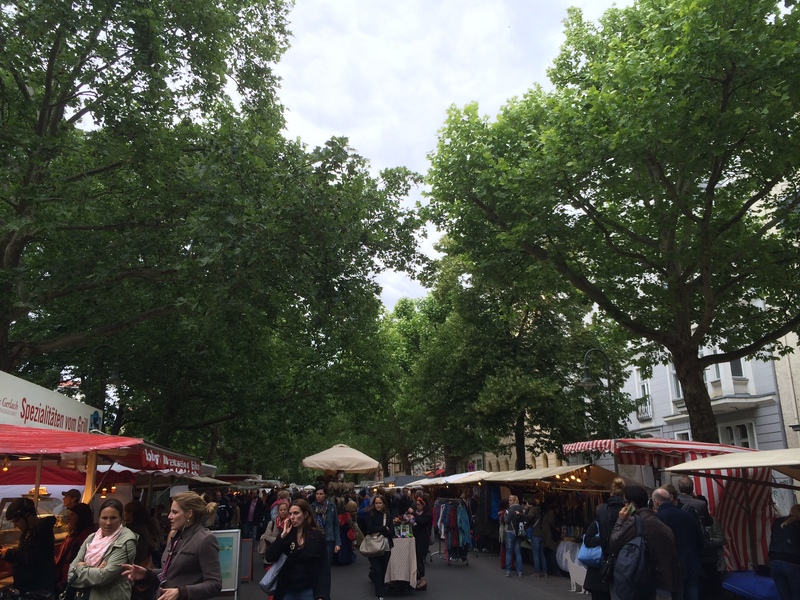 The day is getting on, and – after a beautiful walk through the wochendemarkt in the neighborhood – I am soon in Alexanderplatz to meet a friend for dinner. 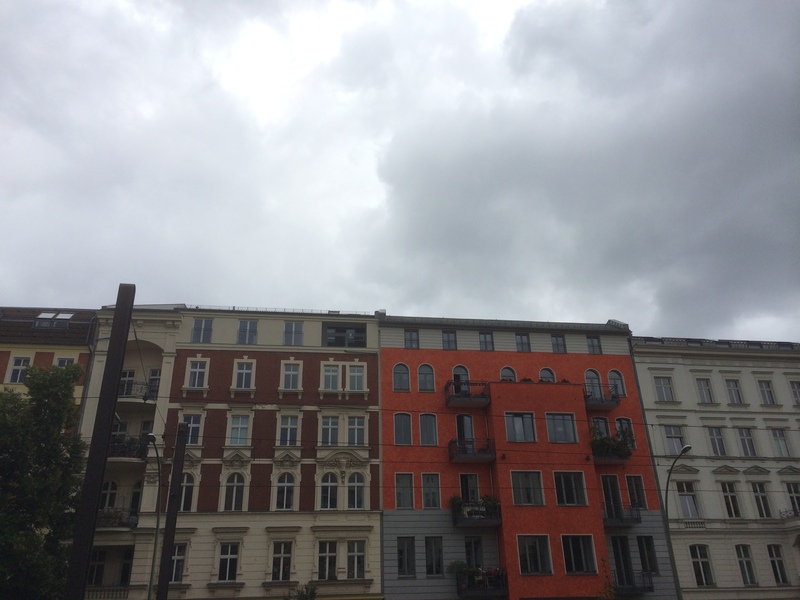 This entry was posted in Travelogue and tagged Berlin, books, bookshops, bookstores, Culture, exploration, Prenzlauer Berg, Slow Travel, travel, travelogue, walk, Walkabout, Walking, wandering. Bookmark the permalink.